St. Engelbert was born in 1185 in Schloss Burg. He was educated at the Cathedral School in Cologne. As early as the age of twelve, he acquired a various number of provostships, in St. Severin in Cologne, Aachen, Deventer, and Zutphen. His cousin was Archbishop of Cologne, and he supported him in the interests of Philip of Swabia against Otto of Brunswick, and was excommunicated by Pope Innocent III. On his submission in 1208, he was pardoned, and in 1212, as an act of penance for his earlier rebellion, he took part in the Albigensian Crusade. He gave his allegiance to the future Frederick II, Holy Roman Emperor. St. Engelbert was elected Archbishop of Cologne, in February 1216, and remained in that office until his death. He trusted the Holy Roman Emperor Frederick II, becoming imperial administrator and guardian of the Emperor’s son Henry VII of Germany, whom was crowned at the age of twelve. He remained his tutor until his death. Many political forces threatened the property of the Archdiocese, and St. Engelbert did his best to protect it. He also defended his personal inheritance that was under attack. He granted municipal rights to many places, and during his career as archbishop of Cologne, he continued to fight for the re-establishment and security of the archdiocese both as an ecclesiastical authority and also as a secular territory. It was said of him that despite his personal piety he was more of a monarch than a churchman. He was also a zealous champion of the Religious throughout his archdiocese. He earned the respect and affection of his subjects through his devotion to justice and his energy in maintaining law, and took great pains to ensure the well being of the religious within his authority. His effectiveness in achieving his goals by all means necessary, including military action, his allegiance to the Pope and the Emperor, and his uncompromising defense of the law and the rights of religious persons and bodies, brought him into conflict with the nobility, including his own family, and this lead to his death. His cousin was Count Frederick of Isenberg, and was abusing his position by defrauding the Nuns of Essen Abbey. St. Engelbert was determined to protect their interests, and sought to bring Frederick to justice. On November 7, 1225, as they returned together from a judicial hearing, he was killed, believed, by Frederick. It seems probable that behind the attack, he was to be taken captive rather than being killed, and was a major threat to a whole group of nobility. His body was taken to Cologne on a dung-cart, and when examined, was found to have forty seven wounds. 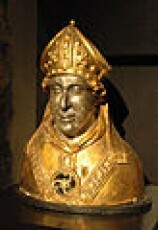 St. Engelbert was the Archbishop of Cologne. He worked his entire life in this position and fought diligently to keep the archdiocese assets together. He worked hard to protect the lives and rights of Religious in his care, and when defending those very rights, was killed by his cousin Count Frederick who was abusing his power in this area.